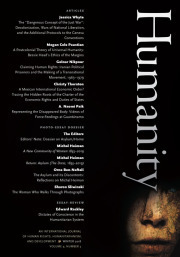 At the heart of our new issue is a dossier on humanitarianism in refugee camps, curated by Maja Janmyr and Are Knudsen. The issue starts out with two early modernist literary critics, Dan Edelstein and Christopher Warren, on human rights and international politics, respectively. Finally, our essay-review section features a startling intervention by Priya Satia on Susan Pedersen’s much remarked study of the League of Nations mandates policies – easily the longest and most trenchant engagement with that book, The Guardians, that has yet appeared. And finally, we are making public on this site, Alexander Livingston’s incisive survey of the moralistic turn of critical theory and its limits.